We are Perth’s leading VR/AR/3D (XR) digital agency offering a range of virtual reality products & services to businesses across Australia and Abroad. Our focus is on creating awe-inspiring virtual reality experiences and apps that will fundamentally improve how your customers interact with your brand. 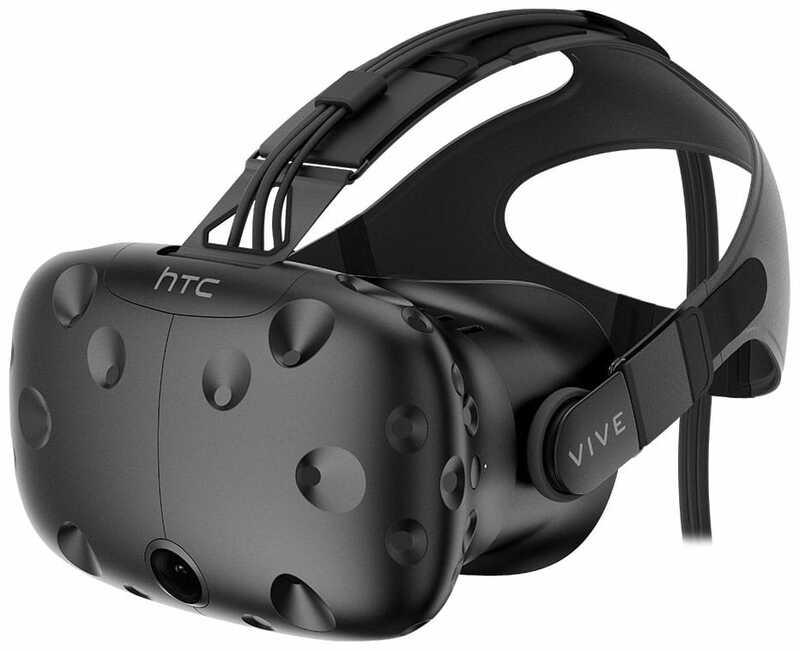 We create VR apps for a variety of VR headsets including HTC Vive, Oculus Rift, Oculus Go, Oculus Quest and more. We work across a wide range of sectors including VR for training & education, VR for architecture, VR for retail, VR for healthcare, VR for tourism and more. We create VR content using game engines such as Unreal Engine & Unity plus capture 360 Photos & 360 Videos to create fully immersive experiences. Stop spending thousands on a few static renders when you can get UNLIMITED renders plus a big screen/games console experience, a room scale VR experience, flythrough animations AND mobile 360 VR tours all for a fraction of the cost. We will not only build these virtual homes for you but also set up and support your VR lounge PLUS train your team. VR solves a huge problem marketers have around engagement and awareness for the following reasons. 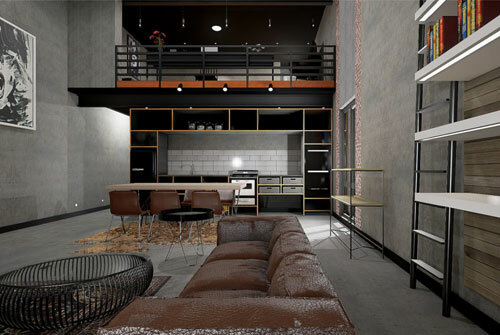 Not only can customers walk or fly freely through the space in a room scale VR experience but they can change finishes to visualise & design their new home. We can build a whole street of virtual display homes for the price it costs to build & maintain one single bricks and mortar home saving thousands of dollars. Our VR lounges can go to your customers. Easy to set up at new estate openings, events, trade shows, shopping malls, universities, anywhere! Low cost, high impact. 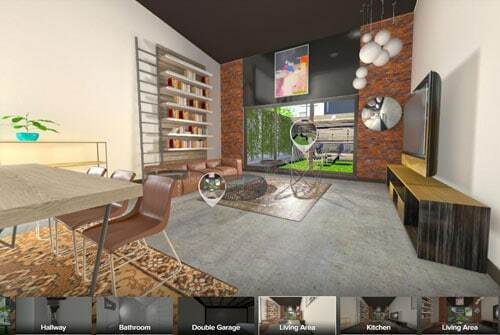 Improve the buying process by adding a VR experience and allowing customers to sit in the comfort of your office and walkthrough multiple home designs in minutes. Get in touch to discuss ideas of how you can build VR into your marketing plans and reach potential customers in a completely new way. 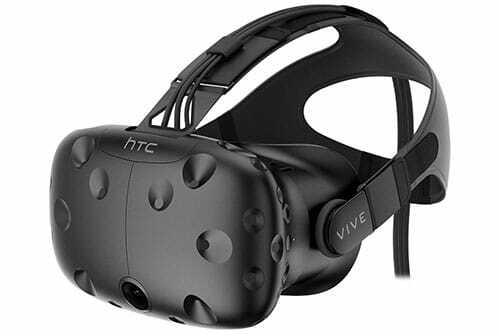 How can VR be introduced into my business plans? VR headsets can be an intriguing and unique addition at local events, trade shows and conferences as well fixed installations in showrooms and offices to offer potential customers a chance to immerse themselves in interactive experiences that showcases your locations, facilities, products & services. It’s the perfect medium for providing an engaging taster experience of what the visitor can expect when they arrive at your destination. With the introduction of the Google Cardboard viewer it has opened up VR experiences to the masses and made it an affordable marketing option for any size of business. The flat-packed Google Cardboard style viewers can be easily posted or made part of existing packaging as a novel promotional tool. 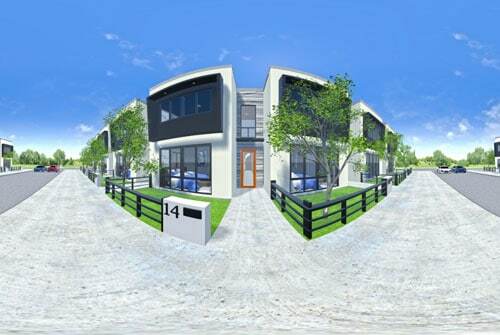 Imagine not having to build another display home and having all your home designs in VR. Buyers from anywhere in the world could walk through your homes 24/7 and customise all the finishes. 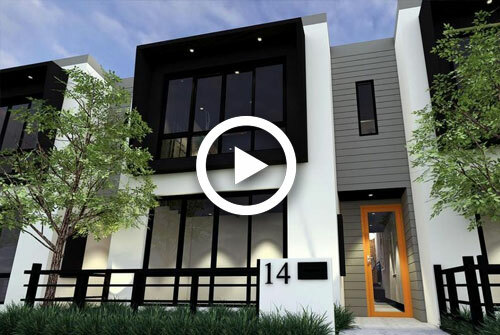 Through combining this high end VR experience with a point to point Google Cardboard style tour, renders and animated video you will have the ultimate home buying experience without a brick being laid. 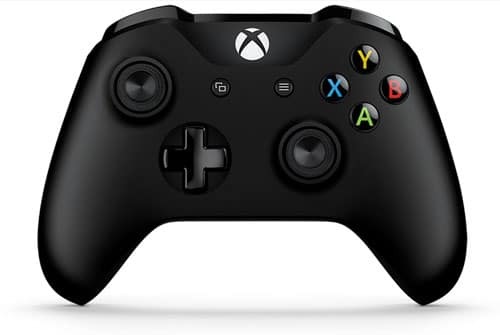 Use a smartphone to allow customers to 'virtually' try an item before buying in their existing surroundings and then connect directly to your online shop to purchase instantly. Using AR to educate & train employees or students at any level of education provides an immersive, multi-sensory experience to compliment traditional methods. With the help of internal location beacons AR Smartphone apps can help with way-finding through complex and large spaces with triggered advertising displayed en-route. AR apps can deliver real-time information to the treatment area to support diagnosis, surgery and treatment plans plus aid remote training of staff. Everyone needs a break right? AR games are leading the way in pushing AR technology just as VR has advanced due to the gaming industry growth. AR apps can act as a virtual guide showcasing a property and informing the future tenant or owner of the highlights and selling points of the space. AR teleportation apps can literally open a door to anywhere in the world allowing a customer to walk through and experience a new destination. VR is not just for games. We specialise in creating VR game engine experiences for real-world applications. 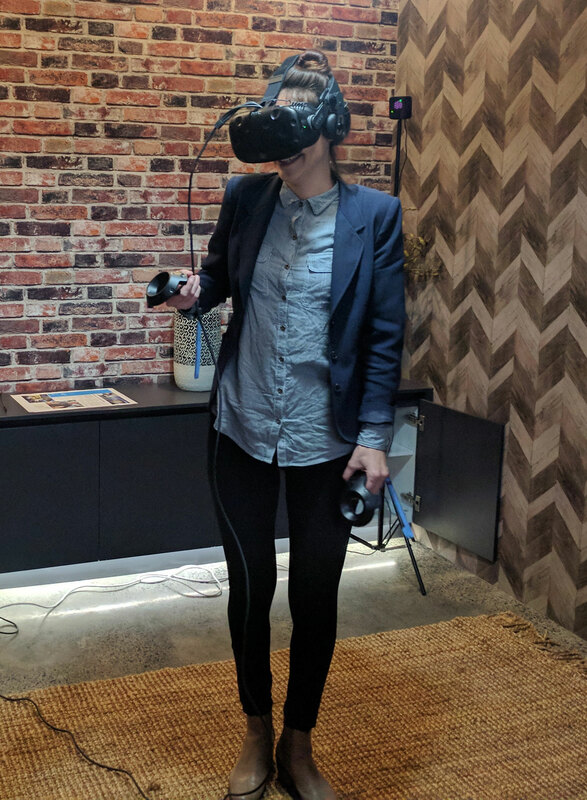 Our focus is on introducing high end interactive VR experiences to the property industry that allow a potential customer the ability to freely explore and customise their future home. 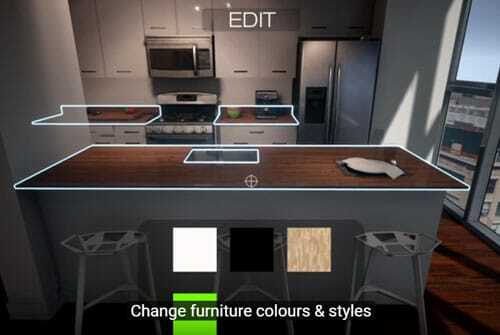 Built inside a game engine home designs can be viewed via a screen with a games controller or using a tethered VR headset like HTC Vive or Oculus Rift. By using a game engine as a platform we are able to create a super rich interactive experience with high fidelity that allows a customer to not only walk freely within the space but also change their surroundings – flooring, walls, cabinets, bench tops etc. 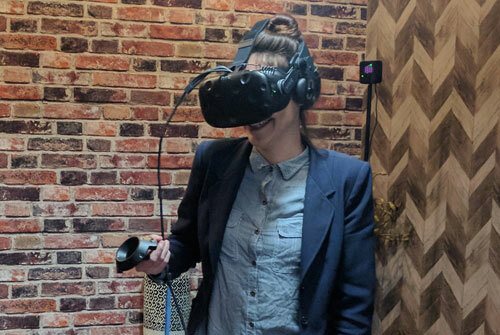 Get in touch with our team to find out how you can introduce interactive VR experiences into your sales and marketing plans. Our prediction is that over the next few years this technology will revolutionise how off plan properties are sold. If you want to innovate and take advantage of being an early adopter then give us a call. Get in touch to discuss ideas of how you can build VR into your marketing plans and reach potential customers in a completely new way. We are available for demos and presentations.